You don’t need to go trekking into the Amazon rain forests or scale the heights of the Himalayas to find superfoods: they are residing in your local supermarket – and can be found in a simple can! Legumes also known as pulses, include all kinds of peas, beans and lentils. 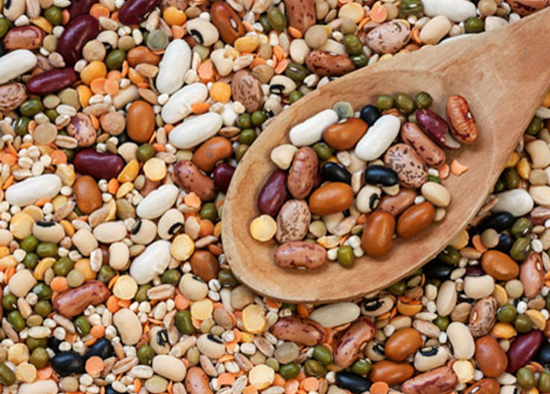 You may have heard that legumes are good for you. However, you may not have realised just how wonderful they are. Legumes are both a source of carbohydrate and protein and are rich in soluble fibre, insoluble fibre and resistant starch. They are packed full of vitamins, minerals, antioxidants and phytochemicals and are low in fat including saturated fat. They even contain small amounts of the plant omega-3 alpha-linolenic acid (ALA) and have a low glycaemic index (GI) – and these features make them exceptionally good for the prevention and management of diabetes and heart disease – and for weight loss. Legumes also act as prebiotics in our guts. Prebiotics encourage the growth of friendly bacteria and inhibit the growth of harmful bacteria – not only helping to keep our guts healthy but also helping to prevent colorectal cancer and managing our weight, moods and chronic disease. With so much goodness in legumes why aren’t we eating more of them? Speaking with my clients I’ve found that there seem to be two main barriers to eating legumes – many people feel that legumes will give them discomfort or flatulence and most people don’t know what to do with them/how to prepare them. The discomfort and flatulence issues can be easily overcome if you gradually add them to your diet. You also need to make sure that you increase your fluid (water, tea, coffee or milk) intake when you increase your fibre intake. So how do you prepare and eat legumes? Eating legumes is as simple as opening up a can! You don’t have to worry about soaking dried beans overnight before you cook them and dried red lentils cook in just 20 minutes (without soaking overnight) – and who doesn’t have a packet of frozen peas in their freezer? Baked beans on toast or in jaffles at breakfast or at any time. Add chickpeas (garbanzo beans), cannellini beans or any beans to salads. Add borlotti beans, butter beans, chickpeas, lentils or any beans to soups and here’s a healthy and tasty Chickpea and Lentil Soup you may like to try. Add lentils, cannellini beans, chickpeas or red kidney beans to casseroles, curries or any dishes that you eat regularly. For example, spaghetti bolognaise or chicken and chickpea curry. Make up Hummus and use as a thick spread in sandwiches for flavour and moisture. Use as an accompaniment with meals, for example roast chicken, potato, carrot, broccoli and chickpeas. Simply toss the chickpeas with lemon juice, garlic, parsley, 1 teaspoon of extra virgin olive oil and season lightly. Try eating a vegetarian meal once per week. For example, lentil moussaka, chilli con carne with red kidney beans, or lentil curry (dhal) and rice. From soups to salads, dips to vegetarian meals, The Omega-3 Diet Revolution and The Total Life Diet books are full of deliciously healthy recipes for legumes. If you would like to know more about how to incorporate more legumes into a healthy and tasty diet for weight loss, diabetes, high cholesterol or simply for good health, please contact us on info@TheTotalLifeDiet.com or telephone 02 9743 1898 to book an appointment.